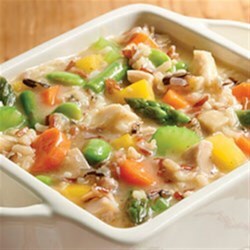 "Chicken soup with lots of veggies, chicken, and whole grains is ready in just minutes." Combine all ingredients in a medium saucepan. Bring to a boil. Reduce heat and simmer 10 minutes.